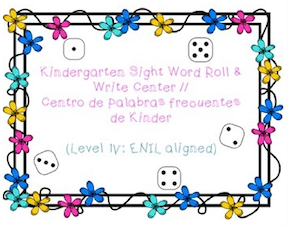 The Best of Teacher Entrepreneurs III: "Kindergarten Spanish Sight Word Center Roll & Write // Palabras frecuentes"
"Kindergarten Spanish Sight Word Center Roll & Write // Palabras frecuentes"
This sight word packet is for beginning Spanish readers. The students roll a dice and find the corresponding word. They write the word one time for each time that number is rolled. 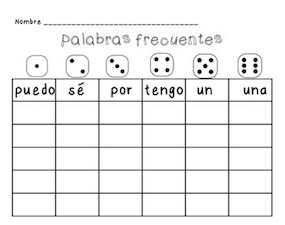 These worksheets are great for centers and keep the children engaged and entertained! I see my students excited to fill their boards as they read the sight words out loud to themselves while they play. 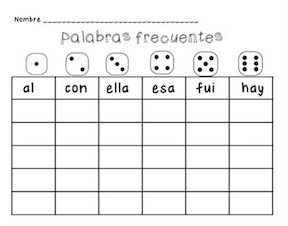 These can also be used whole group and are GREAT for when you have a substitute in your Spanish reading classroom! This packet includes all 60 sight words recommended by the American Reading Company's ENIL for Kindergarten. Get this sight word packet HERE!